I heard the song, “What I Never Knew I Always Wanted”, by Carrie Underwood this past week for the first time and it instantly brought me to tears. There isn’t often that I can completely relate to an entire song. Sure, there are times parts of a song’s lyrics will touch me or connect with me for whatever reason but in this case the whole song immediately resonated with me. My initial feelings when Emsley was born were shock and disbelief. I truly couldn’t believe that I was a mom. I remember the nurses placing her on my chest and instead of looking at her, I turned to look at my husband with wide eyes and an open mouth. I couldn’t believe there was a tiny human on me. Even though I had carried her in my belly for 8 and a 1/2 long months, it was still such a strange thought to me. I remember thinking, “this belongs to me?”, “SHE belongs to me?”. These thoughts lasted for quite some time, even after we came home from the hospital. I would regularly hear people refer to me as a mother or to Emsley as my daughter but it constantly felt as though they were talking about someone else. People would often ask how I was adjusting to my new role as a mom, but I never had much to offer in terms of a response. Looking back now, I think it was because I didn’t really believe that she was here to stay, that she was really mine to keep. My hubby and I decided to host a small dinner for his family at our place this past Thanksgiving weekend. A few months back I had won a turkey through work (random, I know) and had stowed it away in the freezer for safe keeping. Both my husband and I have never prepared a turkey before so we figured a free one was a good place for us to learn, as there was no loss if it didn’t work out! 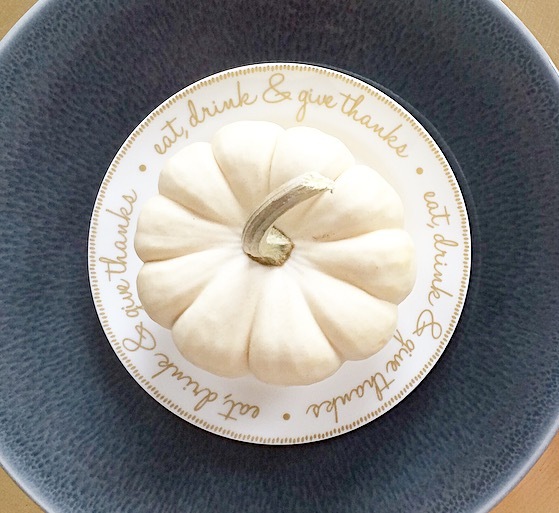 While my hubby managed the turkey (and most of the cooking I might add) I got to work on creating the perfect Thanksgiving tablescape. On the weekends I tend to indulge in “bigger”, sweeter breakfasts and I always make them from scratch. So when I decided to do all things pumpkin a few Octobers ago, I searched the internet for a pumpkin pancake recipe. I came across this one and have been making it at least once each October for the past few years. 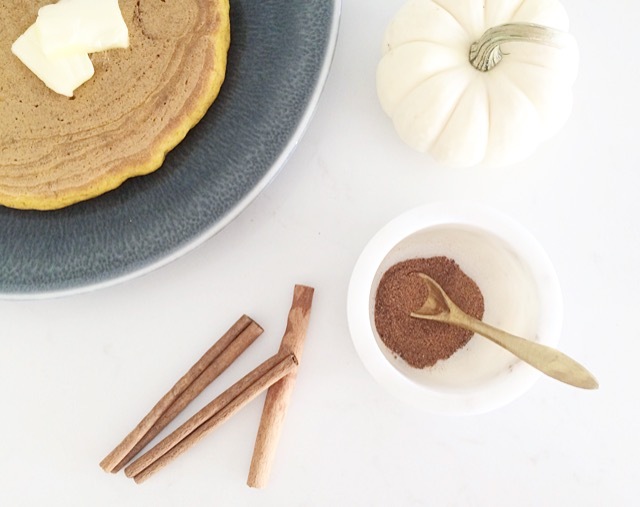 It combines the perfect amount of pumpkin flavour with all the festive fall spices. It’s so simple to make and such a hit! Fall is my absolute favourite time of year to shop for clothing. As the temperatures change and the leaves turn, I gravitate to the beauty of the indoors to purchase chunky knits, large scarves and layers upon layers which make my heart sing and my wallet empty! This year having a little a girl to shop for has given me a whole new reason to be excited about fall shopping, and has really cut down my own personal shopping (baby clothes are just so much more fun to buy, aren’t they?). Even better is that Emsley is finally starting to fit into 0-3 month clothing which is very exciting as it has opened up a whole new shopping world for this momma! 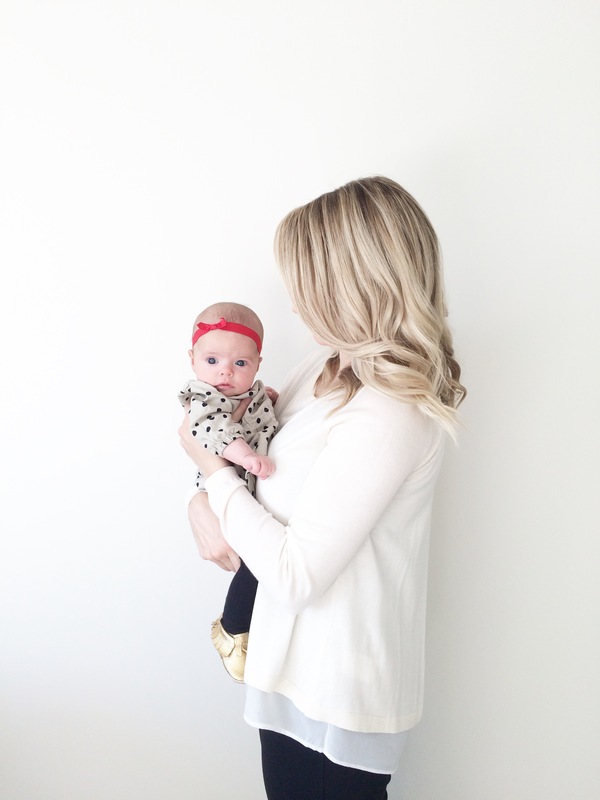 Here are a few of my favourite fall items that I have purchased for her so far! When I first arrived home from the hospital with Emsley I was struggling with the whole concept of breastfeeding as well as the incredible amounts of pain that was associated with it, (see The Truth About Breastfeeding part one if you haven’t already read it). Within a few days of being home, a large, hard mass formed in my right breast and I soon learnt that I had developed a plugged duct. My right breast felt as though it was engorged again; hard and uncomfortable as well as extremely painful. A day after I noticed the lump, I also started to experience some minor flu like symptoms. I felt achy, sore and just “off”. I also didn’t have as much energy as I normally did. Despite feeling unusually yucky, I chalked it all up to the fact that I had just given birth, not realizing at that time that it was connected to the plugged duct.